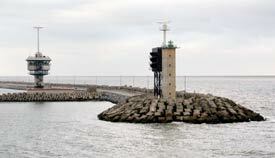 ABOVE: The Port of Zeebrugge's harbor entrance. Zeebrugge, in West Flanders, is Belgium's largest port with more than 10,000 ship moorings annually. Several dozen cruise ships visit Zeebrugge in a typical year, with most passengers heading for nearby Bruges (Brugge) and Ghent. Although Zeebrugge is connected to Hull, Dover, and Rosyth (Edinburgh) by ferries, it's primarily an industrial port. On our most recent visit, our ship--the Silver Whisper--was berthed along a stretch of industrial wasteland that didn't have so much as a phone booth or a Porta-Potty. If you're visiting the Port of Zeebrugge on a ship that doesn't offer a shuttle bus, you'll probably need a taxi to reach the beach resorts of Zeebrugge or nearby Blankenberge (where you can catch trains to Bruges, Ghent, and other cities).